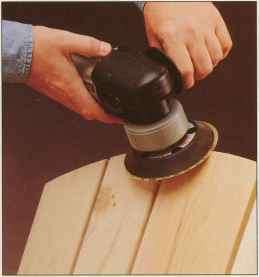 After evening out any slight irregularities in the ends of an Adirondack chair with a belt sander, you can use a random-orbit sander for final smoothing. Outdoor furniture must be designed to rough it, and the Adirondack chair, chaise lounge, and curved chair featured in this chapter are all up to the task. In many parts of the country with harsh winters, the appearance of outdoor chairs marks the return of pleasant weather. Carted out of the garage or basement on the first sunny day of spring, given a quick dusting off, and then left exposed to the elements, they must withstand rough use, indeed, until they are returned to shelter after the first frost. Such treatment places a particular set of demands on the joinery. The blind mortise-and-tenon, for example, which is normally an excellent choice to join chair parts, does not fare so well with outdoor furniture, since the mortise serves as a convenient trap for water. Even with a durable and decay-resistant species, there is the danger that the wood will eventually rot. All three chairs in this chapter solve this problem by using half-lap joints. What it lacks in stoutness, the half-lap makes up for in versatility. It will not trap water and, when reinforced with a weatherproof epoxy and screws, it is exceptionally strong. The joint is also fairly simple to produce. You can make both parts of the connection on the table saw (page 37). If you need to cut a series of half-laps, it will probably be worth your time to make a shop-built jig and do the job with a router (page 83). The chaise lounge (page 44) relies heavily on the half-lap. 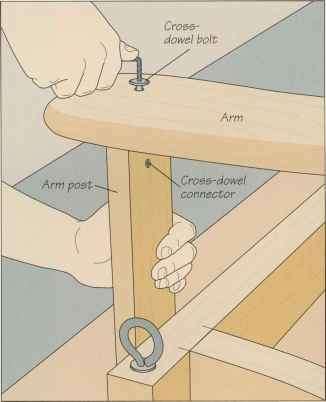 The joint is used to fasten all the back slats to the rails. The back of this classic poolside relaxer can assume six different positions, from the horizontal to nearly vertical. The Adirondack chair (page 24) is among the most familiar pieces of outdoor furniture. Originally named the Westport, after the village in New York's Adirondack Mountains where it probably originated, the chair quickly became popular throughout America. And it remains so to this day, a familiar sight in urban backyards and on country porches. The curved chair (page 34) is an original design, ideally suited for a hidden corner of the garden. Assembled with a number of identical units tied together by a length of threaded rod, the chair derives its gentle curve from circular spacers that hold the units farther apart at the back than at the front. The version shown in this chapter is made up of eight units; you can build a wider chair, or even a bench, by incorporating more units in the design. The chaise lounge shown at left is perfectly suited for stretching out and relaxing. Like the other chairs featured in this chapter, it is made from lightweight but durable Northern white cedar. With its sturdy wheels and portable design, the lounge is easy to move to just the right location. A thin mattress will provide an extra measure of comfort.